Falcons quarterback Matt Ryan has played in two postseason games at this point in his four-year NFL career, and neither one has gone particularly well. In 2009, he passed for 199 yards in a loss to Arizona, throwing two touchdowns but also two interceptions. He also lost a fumble. Then last year, after a 13-3 regular season, his Falcons got smoked by Green Bay, 48-21, in a game in which Ryan passed for 186 yards, and threw one touchdown and two picks. He lost a fumble in that one, too. Ryan, of course, will play in postseason game No. 3 on Sunday, against the Giants at MetLife Stadium. The Giants haven't seen Ryan since November of 2009 — they beat the Falcons in overtime in that one — and that means Tom Coughlin's club will be studying lots of tape this week. 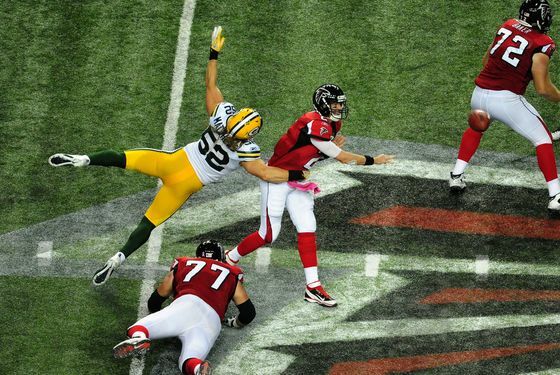 As the Post points out, Ryan doesn't get sacked very often — it helps that Atlanta's running game allows them to effectively use play-action — but in his two playoff games, he was under plenty of pressure: The Cardinals sacked him three times back in 2009, while the Packers sacked him five times last year. Look, eventually, Ryan will notch a postseason victory. He's too good not to, and this isn't like the "never won a Super Bowl" label: It's not that hard to shake it, eventually. But no need for him to do it this weekend, right?